Bringing a rescue dog—especially one that’s been abused—into your home can be a scary prospect. You can’t help but worry that the dog might instinctively resort to aggressive behavior, and Linda Hickey knew this feeling all too well. Linda and her husband, Grant, lived with their two sons and dogs in Johns Creek, Georgia, when they considered bringing a rescue puppy into the family. The puppy had an intriguing story, but Linda worried if a packed house was the ideal place for a once-abused pooch. Complicating matters further, the couple’s youngest son, Jonny, had been diagnosed with autism before his first birthday. “He wasn’t reaching his milestones,” Linda said. They would have to worry not only about how the puppy would react, but how their son would react, too. “I couldn’t even order cold cuts at the deli counter,” Grant added. “I’d roll up to the deli counter and say, ‘give me a half pound of this, a half pound of that,’ and Jonny would just start screaming.” Obviously, it was a delicate situation. The parents knew all too well the anxiety that came with introducing anything new—let alone an abused animal—to the family. How could she make an adoption work? Would it just become one more thing that would aggravate Jonny? Still, Linda had fallen in love with the little pit bull, aptly named Xena the Warrior Puppy. She’d been watching the nightly news when images of the abused pup appeared on the screen. At that time, authorities were on the lookout for those who had hurt the poor dog. The broadcast mentioned a Facebook page for Xena, and Linda headed there right away. “I would pray for her at night, and first thing in the morning… I would sign in [to Facebook] to see if she had made it through the night.” There was no denying it: Linda was in puppy love! 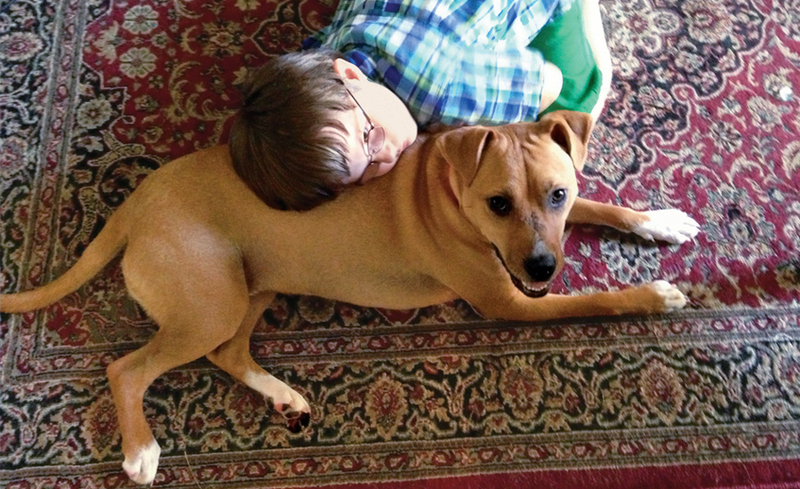 Xena kept fighting, and with medicine, rest, and love, her health greatly improved. “She just got better and better every day and just became more of a regular puppy,” Chrissy said. Soon, she’d be ready to leave intensive care and find a forever home—and Linda jumped at the chance. It was decided that Linda would host Xena for a trial visit. Thankfully, Xena couldn’t contain her excitement! When Grant came home for lunch, Xena was there to plant a smooch right on his face. But the real test—Jonny—was still at school. The family already had several dogs, and Jonny paid zero attention to them. As his dad put it, “It was as if they [Jonny and the dogs] were in parallel worlds,” that never intersected. Would the boy behave similarly with Xena? And would another dog be too many? It was time for the moment of truth. With Xena in tow, Linda drove to Jonny’s school to pick him up. “He couldn’t believe it,” she said, stunned. “It was a complete surprise: she’s lickin’ him all over his face, and he’s smiling ear to ear.” It appeared that the two bonded instantly! Thanks to his newfound friendship, the once unbelievably shy Jonny started to open up! Now when Grant and Linda brought him to the grocery store, he wanted to go inside. That was a far cry from the kid who would throw fits at the deli counter! Everything in Jonny’s life was controlled for him, but with Xena, he was regularly chopping up food and feeding the dogs all on his own. As his anxiety decreased, his opportunities to engage in the world around him increased. And it was all thanks to Xena! In fact, Jonny’s behavior improved beyond just his willingness to go into the supermarket. Before Xena, he’d only had “bad” and “okay” days at school; with his new pet, he started having great days—and he was even named superstar of the week! The duo shared their camaraderie with the world in a YouTube video that raised awareness about a canine’s effects on autism. In the video, Jonny said “we make a good team to spread the word,” but that might’ve been an understatement!